The Embodied Rosary is a blend of tradition and innovation. Praying each of the prayers with a single contemplative, scriptural gesture offers a physical way to connect and stay focused on the mysteries. Even as this method slows the prayer down, time seems to pass more quickly as each of the stories is more fully experienced. Appropriate for all ages, adults as well as children are drawn into the mysteries in a powerful way. With the Embodied Rosary, schools, families, and religious education classes have a tool to enliven this beloved prayer. Pray alongside Jesus, Mary, Joseph, Gabriel, Elizabeth, John the Baptist, Peter, and the disciples. 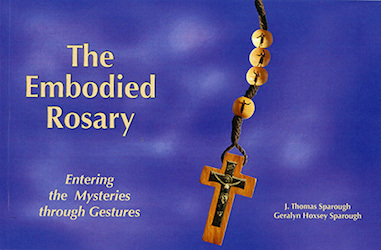 The Embodied Rosary awaits you! 18 North Fort Thomas Avenue. Suite 105. Fort Thomas, KY 41075 | 859.291.1412 © 201Living Magazines, Inc.